McALESTER – Governor Mary Fallin today helped Spirit AeroSystems unveil its second center of excellence focusing on the fabrication of complex commercial and military aircraft parts. 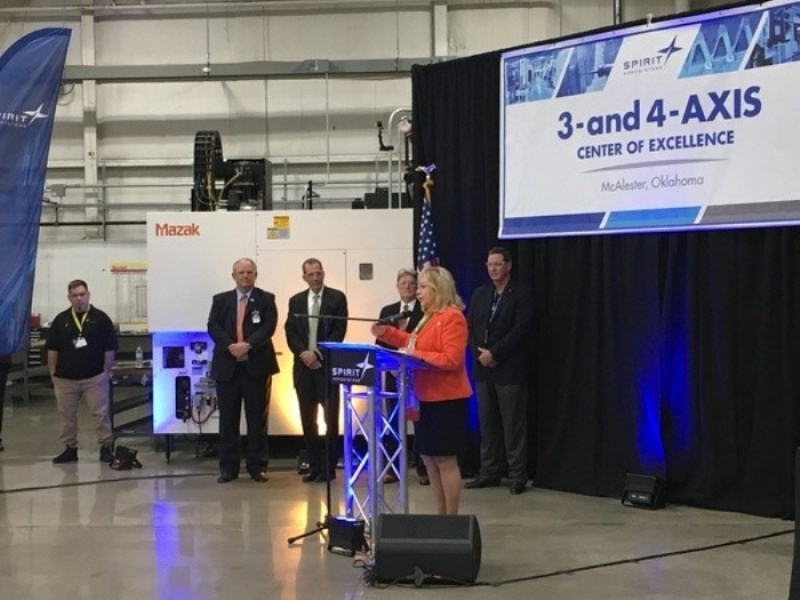 The facility, at the company’s McAlester site, will support current customer contracts while accommodating new work in the global aerostructures market. The purchase and installation of new equipment began in 2017, augmenting the company’s existing capabilities as one of the world’s largest fabricators of aerospace parts. Since production began, more than half of the 1,000 parts scheduled for production in McAlester have been through their first article inspection. “Along with the new five-axis center of excellence that was unveiled in Wichita in February, the center in McAlester further solidifies our competitive advantage for fabrication work,” said Spirit Senior Vice President of Global Fabrication Kevin Matthies. Spirit’s overall fabrication capability spans more than 2.6 million square feet and produces more than 38,000 parts daily. Spirit offers customers a wide range of solutions including machining, skin and sheet metal fabrication. The Wichita site leverages one of the largest automated lines in the world to reliably offer high-volume and high-velocity chemical processing.